Today we’re sharing money tips about things you should never buy with a credit card. Credit cards can be great in a time of need or an emergency. They can also be the worst possible way to pay for something. If you have a credit card, try to only use it on purchases that you can pay off right away when the bill comes in. Things such as gas in the car, or something you might need right away like new tires. I have compiled a starter list of money tips with things you should never use your credit card for. Wedding: Although it would be easiest to just charge whatever it is you want for your big day, avoid paying for anything with your credit card. It is possible to plan the wedding you want within your means and not use credit. You may not be able to say ‘I Do’ at the castle you have dreamed of since you were a little girl, but it won’t change the celebration of the two of you. Do you really want to enter into your new life together with a mountain of debt? College tuition: Instead of paying your tuition (or your child’s tuition) with plastic, apply for student loans and grants. There are so many out there for every qualification. Paying with a credit card is only going to give you a higher interest rate and payments are due immediately. Student loan payments are often not due to start until you are out of school. They also have deferment options as well should you come across some hard financial times. 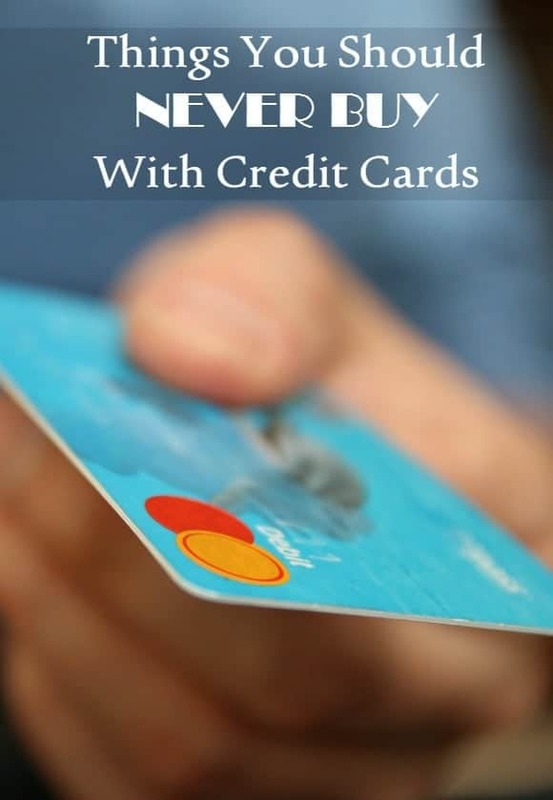 A credit card is non-forgiving in times of financial trouble. Credit cards: Paying off one credit card by using another might sound like a good idea, but don’t do it. With interest rates and finance fees you are just digging yourself into a hole that can be really hard to get out of. Instead, one of the best money tips is focusing on paying off one card at a time. Pay more than the minimum on one card, and pay the minimum on the others. Once the one is paid off, move on to the next. If you have already made some of these purchases with your credit card, it’s not the end of the world. Simply write out a budget for yourself and work on paying off the card. In reality, whenever you use a credit card for something, you always end up paying more than what the item was worth. Have you used your credit card for something you thought you shouldn’t have? Share with us below what you used it for, how you got out of it and what you learned! We always want to hear your great money tips! Follow OurFamilyWorld Magazine’s board Best ways to save money on Pinterest. Love your tips and agree with all of them! Credit cards are my enemy! They seem like they’re helping, but they really just cause so many other problems. I charge everything I buy so that I can earn cash back for my purchases. But, I am also make sure to pay the credit card bill in full each month so I avoid interest. I agree that if the bill cannot be paid in full, do not put it on a credit card!! Guilty as charged and now I am trying to pay down all my debt and it isn’t easy!! I now try to use my debit card or cash to pay for small everyday items! I love these tips. I remember hearing about someone who paid towards his condo across a few different credit cards. He did have the cash, but wanted the reward points. However, I find people use credit cards for everything and don’t realize how much they are actually spending because of interest. These are great tips! I will keep these in mind! The best thing I did was to end my dependence on credit cards. Easier said than done, but worth the effort. Those are some great tips. We used to use our credit cards for everything now we are more mindful. These are great tips! The hubs and I had credit cards when we were younger and screwed ourselves up. We do not use them anymore but hubs has wanted another one for “emergencies” but I’m afraid it will be an easy go-to! Some great advice! I usually pay with cash, but in a pinch use my credit cards. Credit card debt is an awful thing to get control of once its’ out of hand. Absolutely great advise! These are perfect tips that can result in a huge savings! These are great tips. Honestly I like to have a credit card as a security blanket for unexpected expenses, but otherwise it gets paid off every month. These are great tips indeed. There is a lot of hidden fees some times when paying with credit cards. It is always good to beware of the fees. Thanks for sharing. Yes, great tips. I never understood how people put certain things on a credit card. The interest that you pay is horrendous! Very good points. It definitely makes sense to keep those debts off credit cards.